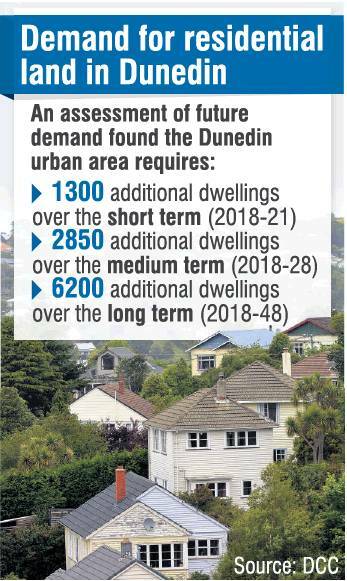 Dunedin will be short 1000 houses by 2028 if more land is not made available for development. The projection comes from a housing capacity report written by Dunedin City Council city development policy planner Nathan Stocker, which examined population growth predictions and available land. Also included in the report, which will be presented to councillors at a meeting of the planning and environment committee tomorrow, is a projected shortfall of about 5000 homes by 2048. Based on current projections the city’s population was expected to reach 134,000 by the end of 2018. There was only enough available housing and land in the second generation plan (2GP) to satisfy demand for the next five years, Mr Stocker said. Since work started on the 2GP in 2012, Dunedin had moved from a low-growth to a medium-growth city and the amount of land made available in the plan was based on lower population growth, he said. Almost twice as many houses were required in the short term than under the growth projections used for the 2GP. Under the Government’s national policy statement on urban development the council was now required to develop options to increase the city’s housing stock and report back within 12 months. It was already considering a plan change to increase housing capacity and a range of options were being developed to address short- and long-term shortages. Infrastructure constraints would also need to be addressed. Dunedin Mayor Dave Cull said the council could not just "wave a magic wand" and make more land and infrastructure appear but it was placed as well as it could be to increase the city’s housing capacity. There had been a sense about two years ago housing issues were "looming", which is why the Mayor’s Taskforce on Housing was set up, Mr Cull said. There would also be a significant investment made by ratepayers to increase the infrastructure needed to support the increased housing, he said. "If you look at those really big growth councils, like Tauranga, Queenstown, Hamilton and Auckland, this is exactly the issue they have been facing for years." There were a range of constraints councils faced as they tried to invest in their districts and cope with significant growth. Developer Allan Dippie said the signs Dunedin was moving to a medium growth city were evident 10 years ago but for some reason the council had chosen to ignore them. Developers had been given the message to stay away from the city, which they had chosen to do, Mr Dippie said. "We’d like to be doing more but we’ve been getting the red light from the council and there’s plenty of land elsewhere, so that’s where we’re going to go." Not everyone wanted to live in an apartment and the council needed to offer enough choices for developers, including greenfield sites, if the demand for housing was to be met, he said. The council have spent an untold fortune on developing and Implementing the 2GP plan and even before it is fully in place it is already out of date and hampering the development of the city. The land is there. Just look at redeveloping Princes Street and surrounding streets. Pull down the crumbling and empty buildings (keeping the best facades) and make them mixed use. Build up 4-6 stories. Easy, just think outside your predefined box. Building in fringe areas is very expensive. The infrastructure of roads, water, power, paths and ongoing servicing costs of waste collection etc is high. Dunedin should be promoting business rather than spending $100's millions on new greenfields suburbs. Some cities in Canada and USA cutting back on developing distant suburbs. Give people a choice of an apartment in the city and walk to work or live in a distant suburb and pay all the costs.